Yesterday's events influence the direction of tomorrow. The question is: are future developments, as a result of past events, foreseen or unforeseen? Are the results of past events mostly unintended consequences or serendipity? This is an age old subject that has been pondered on by logicians, mathematicians, philosophers, social scientists, and historians. In the case of geo-politics and geo-strategy it may be argued that yes there has been a series of calculated steps taken to establish intended developments. Given this case, how far does this drive to achieve expected outcomes go back? It can be argued that, since the dawn of civilization, humanity has always strived to control its prospects. In 1998, Hubert V�drine, a former French foreign minister, started describing America as a "hyperpower." This was a reference to the increasingly aggressive conduct of the U.S. government in global affairs. The statements of Russia, China, and various other nation-states are an alarming indicator of the deteriorating situation in international relations, but this is a direction that American policy makers have been directing the United States towards for decades. Vladimir Putin is correct in the sense that the "Second Cold War" did not begin in 2007; it started years earlier, at the end of the first Cold War, during the decline of the Soviet Union. Or at least the preparations for it were being made during the decline of the Soviet Union. On close inspection, a series of unfolding international events have been anticipated and systematically engineered since the end of the Cold War. The "long war" that is absorbing the globe did not start in 2001, but at the end of the Cold War through a continuum of wars and international events. A global war may have been initiated years before the declaration of the "Global War on Terror" and much of the globe may not have been aware of it. Future historians may end up categorizing several wars going back to the Kosovo War of 1999 as different stages in one singular and "long war." Several fixtures of geo-strategic chess have been unfolding globally, in which the Middle East is one of the most important stages. As simple as it may sound, the endgame of this match of deadly chess is economic control and supremacy. Continuous Reagan-Bush Sr.-Clinton-Bush Jr. War Strategy: Laying the Groundwork for the "Long War"
"As in chess, American global planners must think several moves ahead, anticipating possible countermoves. A sustainable geostrategy must therefore distinguish between the short-run perspective (the next five years), the middle term (up to twenty or so years), and the long run (beyond twenty years). Moreover these phases must be viewed not as watertight compartments but as part of a continuum. The first phase must gradually and consistently lead into the second - indeed, be deliberately pointed toward it - and the second must then lead subsequently into the third." U.S. foreign policy and the wars in the Middle East cut across U.S. political party lines and presidential administrations. There exists no bipartisanship in American foreign policy. The pinnacles of the Democratic Party and the Republican Party have historically worked hand-in-hand in regards to U.S. foreign policy objectives. The White House and the Pentagon were basically given a carte blanche to execute longstanding war plans made under previous presidential administrations after the dire events of September 11, 2001. The war march has been part of a continuum and, in a historical perspective, almost a seamless process. Upon careful examination, it is apparent one presidential administration after another has laid the foundations for the foreign wars of their beneficiaries in the White House. George H. Bush Sr. went to war with Baghdad, arranged the groundwork to dismantle Yugoslavia, and produced the economic sanctions regime that weakened Iraq. William (Bill) J. Clinton weakened Iraq further through a bombing regime, expanded NATO, pressed U.S. bases eastward, helped dismantle Yugoslavia, and laid the footing for invading Afghanistan and lunching the "Global War on Terror." Finally George W. Bush Jr. invaded Iraq and publicly resurrected the Cold War projects of America. Under the Bush Jr. Administration a vital NATO military presence was also established in Afghanistan. Afghanistan can serve as a bridgehead in the Eurasian landmass and is amidst the borders of China, Iran, the former Soviet Union, and the Indian sub-continent. Looking back, in retrospect the grounds for weakening Iraq and Iran simultaneously were established under both the presidential administrations of James (Jimmy) E. Carter, and Ronald W. Reagan. United States Central Command (CENTCOM) was also established in 1983, during the Iraq-Iran War. The establishment of CENTCOM is an important step in the continuous projection of American power into the Middle East and Eurasia. The U.S. Rapid Deployment Force was the antecedent of CENTCOM, which was designed to challenge Soviet intervention in Iraq, Iran, and the Persian Gulf. U.S. Rapid Deployment Force was a large-scale contingent of the U.S. military that was constantly on standby for massive theatre-level war anywhere on the globe. The force also gave special priority to the Persian Gulf and Middle East. The force was essentially the largest standby military contingent of the U.S. and had a special mandate in regards to the geo-strategically important Persian Gulf, an energy breadbasket. The Carter Doctrine was consequently declared after the U.S.S.R. intervened militarily in Afghanistan. On January 23, 1980, Jimmy Carter stated that the U.S. government would use military force within the Persian Gulf region to defend U.S. economic interests. The doctrine was deliberately portrayed as a response to Soviet actions, but nothing could be further from the truth. Eight months later, in September of 1980, the Iraq-Iran War broke out. The Carter Doctrine was a clear message that the Soviet Union should not get involved in the Iraq-Iran War. Afghanistan was also conveniently keeping the Soviets busy while America had an open hand in the Persian Gulf. This was deliberately arranged as part of a cunning American project. According to Zbigniew Brzezinski in a 1998 interview with Le Nouvel Observateur, the Soviet Union was baited into invading Afghanistan in 1979 by the Carter Administration and the CIA. High ranking officials within the Carter Administration also contributed to triggering the Iraq-Iran War, after failing to manipulate the Iranian Revolution in 1979. The involvement of the Soviets in Afghanistan prevented them from intervening in a significant way in Iran. With the Soviets busy in Afghanistan, the Reagan Administration was free to fully push Iraq and Iran, the major military powers of the Middle East, against one another. Machiavellian Geo-Strategy: Playing Iraq against Iran in the "Northern Tier"
Turkey, Iraq, Iran, and Afghanistan were in an area called the "Northern Tier" by American strategists. This area was believed to be the region from which the Soviet Union could breakout of Eurasia by reaching the Persian Gulf. It was also considered to be the area bordering the Soviet Union's most sensitive area. It was from here that a game of expansion, containment, and penetration was being carried out. A balance of power was very important in this regard. One country above all others was vital for the balance of power and that was Iran. If the Soviets overran Iran, they would have direct access to the Persian Gulf and if American or British troops were in Iran they would be directly on the southern and sensitive borders of the Soviet Union. The status quo had been, since the time of the so-called "Great Game" between Britain and Czarist Russia, that Iran would be a military buffer zone. While Iran was an ally of the U.S. and NATO before 1979, there were also restrictions on it in the context a longstanding bilateral relationship with the Soviet Union. Iran severed its military alliance with the United States after the 1979 Iranian Revolution. This was seen as a geo-strategic victory by the Soviet Union. Although the Soviets were concerned about the ideology of the new government in Iran, they were relieved that Iran was no longer colluding with the U.S. and its partners. Nonetheless, there was still a state of mistrust between Moscow and Tehran. The Americans could not intervene militarily in Iran with a view to gaining control over Iran's oil fields. A bilateral treaty between Iran and the Soviets had allowed the Soviet Union to intervene in Iran if forces of a third party operating within Iran were perceived as a menace to Soviet security. Naturally, Moscow would perceive any American invasion of Iran, on the direct borders of the U.S.S.R., as a threat and invoke the bilateral treaty. Under these circumstances, it was to keep their socialist allies in power in Kabul and to prevent the destabilization of Soviet Central Asia via Afghanistan that Soviet troops entered Afghanistan, in context with the 1978 Soviet-Afghan Treaty of Friendship, Cooperation, and Good Neighbourliness. Henry Kissinger has written in regards to the danger from Iraq, "Though not strictly speaking a Soviet satellite, once fully armed with Soviet weapons Iraq would serve Soviet purposes by intimating pro-Western government, such as Saudi Arabia; simultaneously, it would exert pressure on Jordon and even Syria, which while leaning to the radical side was far from being a Soviet puppet." The Americans and their British allies were intent on neutralizing an independent Iraq and an Iran steaming with revolutionary fervor. Also, the other goal of the U.S. and Britain was to regain the lost oil fields of both Middle Eastern countries. The Iraq-Iran War was America's chance to recover the lost oil fields of Iraq and Iran. � Michael K. MccGwire, 1987. � Zbigniew K. Brzezinski, 1997. Close to the start of the Iraq-Iran War, the Soviet government, after talks with the revolutionary government in Tehran, was notified that Iran was terminating Moscow's right to militarily intervene in Iran, and by extension in the Persian Gulf, under the 1921 Treaty of Friendship signed between the Russian Socialist Federal Soviet Republic (S.F.S.R.) and Iran. The reason the agreement was made between the Russian S.F.S.R., instead of the U.S.S.R., and Iran was because the U.S.S.R. was in the process of forming and all its constituent republics had not integrated at the time, in 1921. It was the Treaty of Friendship that was invoked during the Second World War by the Soviets in an attempt to legitimize the Anglo-Soviet invasion of Iran. Under Article 5 and Article 6 of the 1921 Treaty of Friendship, the Soviet military was legally permitted to intervene in Iran if preparations were being made for an armed attack on the U.S.S.R. by a foreign power (e.g., the U.S.). The Soviets objected to Tehran's decision, but were reluctant and bogged down in Afghanistan. Eventually and with time they tacitly accepted the Iranian decision. This Soviet treaty right was also one of the rationales for the existence of U.S. Rapid Deployment Force and its special mandate for the Persian Gulf. The U.S. feared that the Soviets could use Iran's military ties to the U.S. as a pretext into invading Iran and establishing control over the Persian Gulf. The Soviets eventually and essentially relinquished this treaty right after the 1979 Iranian Revolution and the unilateral annulment by Tehran. This was only because Iran was no longer an American ally. By instigating war between Iraq, a Soviet ally, and Iran the U.S. also effectively obstructed any warming of Soviet-Iranian relations that would have greatly endangered Anglo-American interests in the Middle East and caused a geo-strategic nightmare for the White House. They also neutralized the Soviet's Iraqi allies. When Iranian communist leaders were arrested the official newspaper of the Communist Party of the Soviet Union, Pravda, declared that the U.S. had instigated the situation to create animosity between Moscow and Tehran. This was in light of the fact that Iranian communists had helped oust Mohammed Reza Pahlavi, Iran's last shah or king. "The southern rim of Asia - Iran, Pakistan, Afghanistan - is a region of the world that may seem remote and strange to Americans, and yet it is a pivot of the world's security. Within a few years of my 1973 journey, it became an area of upheaval. From the Iranian revolution to the Soviet invasion of Afghanistan to the Iran-Iraq war, events dramatized the vulnerability of the Persian Gulf - the lifeline of the West's oil supply. The vital importance of that region had been one of the themes of the shrewd strategic analysts I was to visit next: Mao Zedong and Zhou Enlai." The Soviet Union, Iraq, Afghanistan, and, lastly in 1979, Iran were independent-minded states in regards to America. By 1980 America had systematically created an arc of volatility and instability from the borders of Soviet Central Asia and Afghanistan running through Iran and Iraq to the Persian Gulf; in the process four nations (the Soviet Union, Afghanistan, Iran, and Iraq) on the doorstep or gateway into the core of Eurasia were weakened. America was also using all four nations to destabilize one another. In retrospect it can be argued that the ground was being prepared for future operations in these areas. Note: Compare the above map with the following map. � Eric Waddell, Global Research 2003. The U.S. had realized from the time of the 1968 Arab Oil Embargo that it had a powerful economic weapon on its hands. Even during the 1968 Arab Oil Embargo the Saudi government was sustaining the U.S. by reinvesting large amounts of capital into the American economy. Henry Kissinger confirmed in his 1982 memoirs that the U.S. was able to strengthen its economic influence over the European and Japanese economies because of the price increase in the oil market, which was linked to the U.S. dollar. The rise in petroleum prices was also used to weaken (or more properly to globally integrate) the economies of the Eastern Bloc and the Communist World. The Iraq-Iran War further tightened the American grip on the global economy. The work of the American sociologist Immanuel Wallerstein puts forward the notion that there is essentially only a singular, but fragmented, "world-system" that is connected and interrelated through a network of economic relationships. This thesis is useful in part for explaining the collapse of the Soviet Union and the Eastern Bloc. One could argue that the Iraq-Iran War was a key aspect in the collapse of the Soviet Union, because of the position of the U.S.S.R. within the singularity of the "world-system." The Soviet Union was a true "energy superpower" in all aspects of the term. It should be noted that Soviet hydrocarbon resources were the sum of all the energy resources of Russia, Central Asia, and the Republic of Azerbaijan. So why didn't the Soviet Union with the combined energy resources of Russia, Central Asia, and the Caucasus profit from the Iraq-Iran War? The price of Soviet petroleum also increased because of the Iraq-Iran War, but to no real benefit to the Soviets. The Soviet economy was affected largely because of the war in Afghanistan, a U.S. snare that ensured that the Soviet economy would not benefit from the rise in petroleum prices. The rise in petroleum prices during the Iraq-Iran War also created a state of economic shock in Eastern Europe. The economic disturbances in Eastern Europe also had a negative toll on the Soviet economy. The Eastern Bloc also opened the door to Western Banks for financial aid to cope with the economic shock that was created by the rise in petroleum prices. This would be a lethal mistake. Moreover, while the manipulation of oil prices benefited France and West Germany to some extent; it also benefited the Anglo-American alliance by spoiling any economic rapprochement between Paris, Bonn, and Moscow. It should be noted that the Soviet Union disengaged itself from Afghanistan in 1988, the same year that the Iraq-Iran War ended. In 1988, the Soviet effort to stabilize the Soviet economy was also underway. After the Iraq-Iran War ended in 1988, the U.S. tried to sabotage and to further destroy the devastated economies of Iraq, Iran, and the Soviet Union by deliberately getting Saudi Arabia and the Arab Sheikhdoms of the Persian Gulf to lower the price of oil. The Soviets, the Iraqis, and the Iranians were planning on making the most of their vast energy resources, but their programs were stopped or obstructed in their tracks by the deliberate manipulation of petroleum markets. Washington D.C. was cleverly "killing several birds with one stone," so to speak. "...America possesses not only overwhelming strategic power- constantly enhanced by technological innovation- but also an unmatched capability to project its conventional forces to distant areas." In one of his books, Out of Control: Global Turmoil on the Eve of the 21st Century, Zbigniew Brzezenski writes, "For the world at large, one of the most impressive aspects of the U.S. military performance in the Gulf War of 1991 was the manner in which the United States was able to deploy, and logistically sustain, a force of several hundred thousand men in the distant Arabian peninsula [sic]." The truth is that President George H. Bush Sr. would never have been able to deploy forces to the Middle East with such ease without the work of his presidential predecessors. The groundwork was prepared for him by the Reagan, the Carter, and the Ford Administrations. The existence of the U.S. Rapid Deployment Force, which later became CENTCOM, was an extremely important step for U.S. operations in the Middle East. The deployment of U.S. troops to Saudi Arabia in 1991 was part of an operational continuum. It should be noted that U.S. Rapid Deployment Force was created by the Carter Administration on August 24, 1977 through a presidential directive based on the work of President Gerald Ford and Vice-President Nelson Rockefeller. 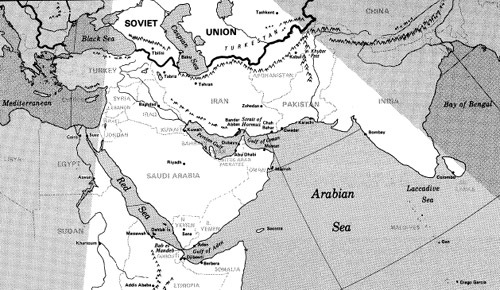 With the collapse of the Soviet Union the U.S. was able to bolster its plans to dominate the Persian Gulf. The Persian Gulf was militarized over a long period of time through three successive wars: the Iraq-Iran War (1980-1988), the Persian Gulf War (1991), and the Anglo-American invasion of Iraq (2003). After the British left the Persian Gulf, the area was militarized by the U.S. through the arguable necessitation of foreign ships being present to protect oil shipments and maritime traffic. This position was further endorsed during the Iraq-Iran War when the U.S. Navy flagged Kuwait oil tankers and fought against the Iranian Navy. The invasion of Kuwait and the subsequent American-led war with Iraq allowed the U.S. to establish bases in Saudi Arabia and the Persian Gulf in a second phase of militarization. A third phase of militarization started in 2003. This third phase involved the transfer of American and British assets into Iraq and the establishment of permanent super-bases starting in 2003/2004. NATO has also signed agreements with Arab states in the Persian Gulf littoral as the Franco-German entente becomes more involved in the management of the Middle East. "The country that exerts the greatest amount of influence on the region, on the [Persian] Gulf and its oil, will consolidate its superiority as an unrivaled superpower. This proves that if the population of the [Persian] Gulf - and of the entire Arab World - is not vigilant, this area will be ruled according to the wishes of the United States." The British attempted to control the Persian Gulf in the past and the U.S. government has inherited this task. The interests of the same Anglo-American elites are still at play, but America is the new vessel or agent of execution. American foreign policy in the Middle East is a continuation of British foreign policy in the area. After the Iraq-Iran War the understanding between Iraq and Washington D.C. faded. Iraq was no longer needed; Iraq had crippled its own economy in the process of confronting Iran militarily. In February 1990, Saddam Hussein warned the Arab World that the U.S. was seeking to establish itself permanently in the Middle East and to take control of the region and its resources. Little did Saddam Hussein know that he would be baited into a disastrous war about a year later, a war which provided the U.S. with the pretext for the permanent U.S. deployment in the Middle East that he forewarned against. Iraq would become a victim of the Carter Doctrine. In the later half of the 1990s, Iraq, which needed heavy financial help to fight Iran, was headed towards even greater levels of external debt because of the deliberate economic manipulation of oil prices. Oil prices were pushed downwards through excess production. At the time, Iraqi debts to Saudi Arabia and Kuwait were in the tens of billions of dollars. The late Saddam Hussein and the Iraqi government were angry and at odds with the rulers of Saudi Arabia, Kuwait, the U.A.E., Bahrain, and Qatar for what they saw as a betrayal. Iraq accused their governments, especially Kuwait, the U.A.E., and Saudi Arabia, of conspiring to destabilize the Iraqi economy and impoverishing its people. The manipulation of oil prices by the U.S. and the Arab Sheikdoms was seen by Baghdad as economic warfare. This was all after Iraq, once liberally termed "the superpower of the Arab World," had shattered its economy, military strength, and resources fighting Iran and all for naught. "The year 1991 saw the definitive end of the Cold War and the bipolar era." When Lebanon was attacked by Israel in July of 2006 the Lebanese stated that there was an "Arab conspiracy" against Lebanon. The Arab dictators and regimes had been co-opted to support Israel against them they said, but before there was an Arab conspiracy against Lebanon in 2006 there was one against the Iraqi people dating back to the end of the Iraq-Iran War. Although it should be noted that Palestine suffered betrayal from Arab leaders before both Lebanon and Iraq. Tariq Aziz is quoted as saying during an Arab summit, in Tunisia in 1990, "We [meaning Iraq] are sure some Arab states are involved in a conspiracy against us. We want you to know that our country [Iraq] will not kneel, our women will not become prostitutes, our children will not be deprived of food." A conspiracy against Iraq by fellow Arab governments was economical and Iraq had caught on. Baghdad perceived the U.S. to be the main architect of the scheme. In fact Iraq would also catch on and try to fight back economically, almost ten years later, by selling its oil in other foreign currencies besides the American dollar in November of 2000. "[The Gulf War] is an historic moment. We have in this past year made great progress in ending the long era of conflict and cold war. We have before us the opportunity to forge for ourselves and for future generations a 'New World Order'..."
Finally Iraq was entrapped into invading Kuwait in August of 1990 with what Baghdad believed was an okay from President George H. Bush Sr. and the White House through April Glaspie, the U.S. ambassador to Iraq. The transcripts of the discussion between Ambassador Glaspie and Saddam Hussein confirm that Iraq was ensnared by the Bush Sr. Administration. U.S. officials in Washington D.C. also made it appear that the U.S. believed that the invasion of Kuwait was an "Arab-Arab issue." The Iraqis also claimed that they invaded Kuwait to stop Kuwait from permanently damaging the Iraqi economy by flooding the global market with more oil. John Kelly, The U.S. Assistant Secretary of State for Near Eastern Affairs, testified to the U.S. Congress that the "United States has no commitment to defend Kuwait and the U.S. has no intention of defending Kuwait if it is attacked by Iraq," on July 31, 1990, two days before the Iraqi Army marched into Kuwait. Margaret Tutweiler, the U.S. State Department spokeswoman, also told the international press on July 26, 1990 that the U.S. government had no objections or diplomatic message to Iraq about the mobilization of 30, 000 Iraqi troops that appeared to be planning an invasion of Kuwait. The U.S. was aware that the Iraqis would be monitoring Washington D.C.'s responses to Iraqi mobilization and Baghdad's plans to invade Kuwait. Iraq was clearly led on by the U.S. government. Aside from Iraq's global importance as an energy supplier, Iraq's geographic location is also central to the whole Middle East. With a central footing in Iraq the U.S. could spread out or control the rest of the Middle East and the head of the Persian Gulf. The Middle East, in addition to the Indian sub-continent, is also sandwiched between America's Eurasian bridgeheads, Europe, and the Far East. Additionally, Iraq serves as a gateway of entry into Iran and as a natural barrier between Iran and the rest of the Arab World and debatably even the Persian Gulf. On the other hand, Iran serves as a geographic gateway into the Caucasus, the Caspian Sea, and Central Asia. Establishing a footing in Iraq is a logical step in containing the spread of Iranian influence in the Arab World and pushing inwards into Central Asia. Therefore the invasion of Iraq would be vital in a drive towards Central Asia, through securing Iran, and ultimately encircling Russia and China. 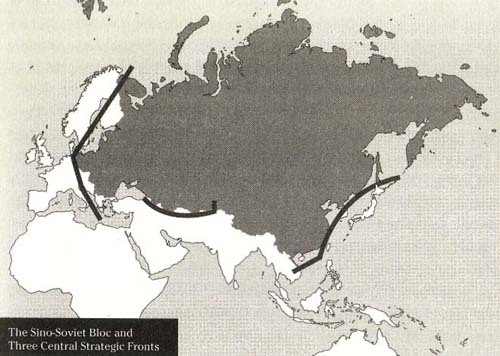 1997-1999: The Preparation Years for the "Long War"
"Eurasia is the world's axial supercontinent. A power that dominated Eurasia would exercise decisive influence over two of the world's three most economically productive regions, Western Europe and East Asia. A glance at the map also suggests that a country dominant in Eurasia would almost automatically control the Middle East and Africa. With Eurasia now serving as the decisive geopolitical chessboard, it no longer suffices to fashion one policy for Europe and another for Asia. What happens with the distribution of power on the Eurasian landmass will be of decisive importance to America's global primacy and historical legacy." A lot of work and planning goes into preparing military campaigns, especially ones of great magnitude such as the "Global War on Terror." In 1997 the Clinton Administration began taking the necessary steps and planning for NATO expansion into Eastern Europe and the post-Soviet vacuum. This was not done under the Clinton Administration's individual initiative, but as part of a long-term American agenda. By this time, the Soviet Union, the dinosaur of Eurasia, had finally collapsed. Containment had just redefined itself as penetration. On October 9, 1997 Zbigniew Brzezinski, one of America's most prominent geo-strategists, told the U.S. Senate Foreign Relations Committee that NATO's enlargement was crucial to the future of the U.S. and American foreign objectives on a global scale. On October 10, 1997, on day after Zbigniew Brzezinski's testimony the U.S. helped create an alliance of ex-Soviet republics that were predisposed towards entering the orbit of NATO. The Organization for Democracy and Economic Development, better known as the GUAM Group was created as a political, economic and strategic alliance between Georgia, Ukraine, the Republic of Azerbaijan (Azarbaijan), and Moldavia. GUAM, the organization's alternative name was an acronym for the names of these countries. The leaders of all four were vying for greater independence from the orbit of Moscow. NATO was critical for offering support to the four ex-Soviet republics. GUAM was designed to be NATO's stepping stone into the former Soviet Union. All four nations were slatted by Washington D.C. and Brussels to ultimately join NATO. Two years later, in 1999, NATO expanded into Eastern Europe and Uzbekistan left the Collective Security Treaty Organization (CSTO) to join the GUAM Group, which became renamed as the GUUAM Group. In 1998, NATO troops were already holding joint exercises in Uzbekistan with Uzbek troops and Uzbekistan was getting large amounts of aid from the U.S. and NATO. In the same year that Uzbekistan left CSTO and NATO expanded, 1999, the groundwork on establishing a joint missile shield with Japan also began in Asia. This was in line with Zbigniew Brzezinski's demands that a single policy be developed for Europe and Asia. America was starting to take a Eurasian approach to its policies in Europe and Asia. 1999 was also the year that NATO declared war on Yugoslavia under the ironic pretext of a "humanitarian mission" in Kosovo. NATO and U.S. bases were also pushed eastwards in Europe. None of these events are coincidental; they are all carefully planned steps of a "military roadmap." It was the subsequent bases that were established in the Balkans after the 1999 NATO war on Yugoslavia that allowed the logistical groundwork for an invasion of Afghanistan in 2001 and Iraq in 2003 to take place. These are different battles of the same war. Breaking Yugoslavia: Eastward Prerequisite for Targeting Russia and the Middle East? "Yugoslavia, consisting of Serbia and Montenegro, fits into the geopolitical plans of the U.S., and to a lesser degree NATO countries, because it's there, strategically located, and this has to be addressed." Bill Clinton said "If we're going to have a strong economic relationship that includes our ability to sell around the world, Europe has got to be a key...That's what this Kosovo thing [meaning the war with Yugoslavia] is all about," during the NATO bombing campaign over Serbia and Montenegro. The wars in Yugoslavia were a case where the Franco-German entente, France and Germany, and the Anglo-American alliance, the U.S. and Britain, were working hand-in-hand to extend their spheres of influences. Future developments were being foreshadowed from the Franco-German and Anglo-American collusion. In the wake of the Dayton agreement of 1995 and the NATO invasion of Kosovo in 1999, U.S. and NATO military bases, formally and informally, mushroomed in the Balkans with no treaty limitations. One of the largest U.S. military facilities in the Balkans is the Bondsteel military base. Bondsteel is situated in the Serbian province of Kosovo, inhabited predominately by ethnic Albanians. From Kosovo, the former Yugoslavian Republic of Macedonia (FYROM) was also destabilized and engaged into the orbit of NATO powers. The 1991 Gulf War, the 2001 invasion of Afghanistan, and the 2003 invasion of Iraq are functionally related to the wars in the Balkans and the dismantling of Yugoslavia. These series of wars are part of a broader post-Cold War military roadmap in Eurasia. The destabilization and subsequent bombardment of Yugoslavia should be considered as a distinct stage in the "Eurasian roadmap," which was beneficial to the establishment of U.S. bases and an extended U.S. sphere of military influence in Southeastern Europe. Britain, France, and Germany were America's partners in this endeavour. The stage was being set for the long march east towards the heart of Eurasia. These bases in the Balkans subsequently also had no limitations stipulated by international treaty with Russia and its allies on the number of forces the U.S. is allowed to post in Europe. The bases set up in the Balkans were also not under the scrutiny of the Treaty on Conventional Armed Forces in Europe (CFE-1989) or the Adapted Conventional Armed Forces in Europe Treaty (CFE-1999). Preparing for the "Long War:" Drafting the "Bush Doctrine" and the "Global War on Terror"
The Washington Post reported in 2002 that the Bush Jr. Administration inherited its counter-terrorism strategies used in the "Global War on Terror" from the Clinton Administration. The fight against Al-Qaeda was not initiated by the Bush Jr. Administration, but was initiated and drafted by the Clinton Administration. It should also be noted that it is also under the term of the Clinton Administration that Al-Qaeda was revealed to be an American product being used in Bosnia-Herzegovina and the Balkans. This is an important fact to remember. The Clinton Administration had also crafted the invasion plans for Iraq. In fact it was the economic sanctions and the Anglo-American bombing campaigns under the Clinton Administration that softened Iraq for a ground invasion under the Bush Jr. Administration. Iraqi air defences were also seriously eroded by the time Iraq was invaded in 2003. The no-fly zones over pre-2003 Iraq, that were declared by the U.S., British, and French government were also not internationally recognized or de jure (legal). The bombardment of Iraq and Iraqi defensive facilities was carried on for years under the Clinton Administration, but were acts that were hardly noticed by the North American and British press. Under the Clinton Administration a dual containment policy in regards to Iraq and Iran had also been drafted, or upgraded. This was in addition to an ambitious dual-phased invasion plan for conquering both Iraq and Iran. In Afghanistan the U.S. and British governments sponsored radical elements of the Afghan Mujahedin and helped nurture what became the repressive Taliban via Pakistan and the Pakistani Inter-Services Intelligence (ISI). These 1982 Israeli policy statements forecast the strangulation of the Iraqi nation through the geo-strategic manipulation of Iraq and Iran against one another. However, this was not an idiosyncratic Israeli strategy, but an element of a far broader joint Anglo-American and Israeli strategy in the Middle East and Eurasia. Many years have passed since the Soviet invasion of Afghanistan and the bloody Iraq-Iran War. Both wars were instigated by the White House and 10 Downing Street as part of a calculated and long-term global strategy. It is through these wars and both the 1991 Gulf War and 1999 Kosovo War that the seeds of the wars of the Twenty-First Century have been planted. Just as the First World War led to the Second World War, these wars have led to further conflicts and wars. There is no doubt, these wars are elements of a "long war" that is part of the effort to establish what Professor Yoshihiro Francis Fukuyama calls an "end to history" through a singular global polity or what George H. Bush Sr. called a "New World Order" during the period of the Gulf War. This is the history and the ultimate objective of the bloody march to war. Vladimir Vladimirovich Putin, Speech at the Military Parade Celebrating the 62nd Anniversary of Victory in the Great Patriotic War, (Commemoration Speech, Red Square, Moscow, Russia, May 9, 2007). Note: The Great Patriotic War is the name used in Russia and the former U.S.S.R. to designate the Second World War. Vladimir Vladimirovich Putin, Speech and the Following Discussion at the Munich Conference on Security Policy (Address, Munich Conference on Security Policy, Munich, Bavaria, February 10, 2007). James Earl Carter, Third State of the Union Address, (State of the Union Address, Capitol Hill, Washington, District of Columbia, January 23, 1980). Zbigniew Brezinski, "Oui, la CIA est entr�e en Afghanistan avant les Russes...," Le Nouvel Observateur, January 15-21 Issue, 1998, p.76. Note: The term Russians ("Russes" in French) is improperly used instead of Soviets, the proper national label. Henry Kissinger, Years of Upheaval (Boston, Massachusetts: Little, Brown and Company, 1982), p.669. William M Reisman, Termination of the U.S.S.R.'s Treaty of Right of Intervention in Iran, American Journal of International Law, vol. 74, no. 1 (January 1980): p.144-154. Note: Outside of Iran the treaty title used the name "Persia," the title used in reference to Iran outside of the Middle East until 1935, to refer to Iran. It was in 1935 that the government of Reza Pahlavi asked those nations referring to Iran as Persia to use the proper title (Iran), which was used by Iranians themselves to refer to their country. Reza Pahlavi also did this as a result of British attempts to divide Iran, like the Ottoman Empire, during the First World War. A comparison to this would be if Greece requests the international community use the name Hellas instead of Greece or if Finland asked the international community to refer to it by the name Suomi instead of Finland or if Germany asked to be called Deutschland. The subject is also compounded by the fact that labeling Iranians as Persians and Iran as Persia is incorrect and is similar to labeling all Britons as Englishmen and Britain as England. Englishmen, Scots, and Welshmen are all Britons or British. England is only just one of the component countries of Britain or formally the United Kingdom of Great Britain and Northern Ireland. In similarity Persians, like Kurds, are just one Iranian sub-group and Persia or Pars/Fars is historically a province within Iran. The ancient Achaemenids, such as Cyrus II and Xerxes I, the Arsacids, such as Mithridates I, and Sassanids all referred to their empires as Iran or different variances of Iran. (1) To prohibit the formation or presence within their respective territories, of any organization or groups of persons, irrespective of the name by which they are known, whose object is to engage in acts of hostility against Persia or Russia, or against the Allies of Russia. They will likewise prohibit the formation of troops or armies within their respective territories with the aforementioned object. (2) Not to allow a third party or organization, whatever it be called, which is hostile to the other Contracting Party, to import or to convey in transit across their countries material which can be used against the other party. (3) To prevent by all means in their power the presence within their territories or within the territories of their Allies of all armies or forces of a third party in cases in which the presence of such forces would be regarded as a menace to the frontiers, interests or safety of the other Contracting Party. If a third party should attempt to carry out a policy of usurpation by means of armed intervention in Persia, or if such Power should desire to use Persian territory as a base of operations against Russia, or if a Foreign Power should threaten the frontiers of Federal Russia or those of its Allies, and if the Persian Government should not be able to put a stop to such menace after having been once called upon to do so by Russia, Russia shall have the right to advance her troops into the Persian interior for the purpose of carrying out the military operations necessary for its defence. Russia undertakes, however, to withdraw her troops from Persian territory as soon as the danger has been removed. Those who sit in the halls of power have an intimate link to private enterprise or large corporations. They use their nations' foreign policies and state revenues to advance the needs of these enterprises. For example, most directors of the CIA come from Wall Street and go back to Wall Street once they leave the CIA or many generals in the Pentagon end up sitting on the boards of huge corporations. For example General Shelton, who was the chairman of the Joint Chiefs of Staff until September 30, 2001, upon his retirement obtained several lucrative corporate positions. Hence, Dwight D. Eisenhower's statement in his farewell 1960 speech: "In the councils of government, we must guard against the acquisition of unwarranted influence, whether sought or unsought, by the military-industrial complex. The potential for the disastrous rise of misplaced power exists and will persist." The following is taken from Chapter 7 (David Simon: The Transformer) of The New Global Leaders: Richard Branson, Percy Barnevik, David Simon and the Remaking of International Business to further illustrate this point; "Twenty-four hours after the Labour party's landslide victory in the British general election in May 1997, the Financial Times mentioned almost as a by-the-way comment that Sir David Simon, chairman of British Petroleum, was to be offered the position of minister of Europe and a seat in the House of Lords. The rumor was pounced on by the pro-Tory press, clearly eager to exploit what looked like an early breach in Prime Minister Tony Blair's cabinet..."
 Joseph Stark and Martha Wenger, U.S. Ready to Intervene in the Gulf War, Middle East Research and Information Projects (MERIP) Reports, no. 125/126 (July-September, 1984): p.47-48. Note: The term Persian Gulf War was originally used to describe the Iraq-Iran War. Because of the animosity of Iraq and the Arab Sheikdoms towards Iran a modern naming dispute over the body of water came about. Iraq and the Arab Sheikhdoms started calling the Persian Gulf the "Arab Gulf" or simply the "Gulf." The name Arab Gulf or Arabian Gulf has been the alternative historical name of the Red Sea, but is used as ammunition in the socio-political dimensions of disputes with Iran, first under Mohammed Reza Pahlavi and then under Ayatollah Khomeini. The disputed name of the body of water between Iran and the Arab Sheikdoms to its south has deliberately been used to fuel ethnic and national tensions between Arabs and Iranians. Kissinger, Years of Upheaval, Op. cit., p.863. Zbigniew Brezinski, Out of Control: Global Turmoil on the Eve of the 21st Century (NYC, New York: Charles Scribner's Sons Macmillan Publishing Company, 1993), p.88. Thomas E. Ricks, Military Envisions Longer Stay in Iraq, The Washington Post, June 10, 2007, p. A01. Cheney warns Iran, assures allies on Gulf visit, Reuters, May 11, 2007. Russell Watson et al., Was Ambassador Glaspie Too Gentle with Saddam?, Newsweek, April 1, 1991, p.17. Excerpts From Iraqi Document on Meeting with US Envoy, The New York Times, September 22, 1990, p.19. Note: ABC News provided the Iraqi Foreign Ministry transcripts from the July 25, 1990 meeting between Saddam Hussein and April Catherine Glaspie, the U.S. Ambassador to Iraq. Kaleem Omar, Is the US State Department still keeping April Glaspie under wraps?, Jang, December 25, 2005. Zbigniew Brzezinski, Introductory Statement on NATO Enlargement, (Testimony, United States Senate Foreign Relations Committee, Washington, District of Columbia, October 9, 2007). Note: The writings from Brzezinski's paper for Foreign Affairs and the Council on Foreign Relations (CFR) were also used for his book The Grand Chessboard: American Primacy and the Geostrategic Imperatives that had its first edition published in 1997. Brzezinski's 1997 Foreign Affairs journal entry is a condensed synopsis of his 1997 book. Points and quotes cited from it are identical or almost identical to the writing from his 1997 book. Barton Gellman, A Strategy's Cautious Evolution: Before Sept. 11, the Bush Anti-Terror Effort Was Mostly Ambition, The Washington Post, January 20, 2002, p.A01. The dual-containment policy used in regards to both Iraq and Iran was designed for two reasons. The first reason was to prepare the framework for U.S. control of both nations, and the second was to prevent Iran from establishing a large sphere of hegemonic control. The U.S. clearly recognized Iran as their adversary in the Middle East, whereas Iraq was identified as an objective. The Iraq-Iran War and the Gulf War, along with U.N. economic sanctions, had broken Iraq. Oded Yinon, A Strategy for Israel in the Nineteen Eighties, trans. Israel Shahak, Zionist Plan for the Middle East, ed. Israel Shahak (Belmont, Massachusetts: Association of Arab-American University Graduates, 1982), p.12. The Indo-Arabian Region [map]. Scale not given. In: Michael MccGwire. Military Objectives in Soviet Foreign Policy. Washington, D.C.: Brookings Institution Press, 1987, p.184. Kenneth Velasquez. The Sino-Soviet Bloc and Three Central Strategic Fronts [map]. Scale not given. In: Zbigniew Brzezinski. The Grand Chessboard: American Primacy and the Geostrategic Imperatives. NYC, New York: HarperCollins Publishers, 1997, p.7. Kenneth Velasquez. Global Zone of Percolating Violence [map]. Scale not given. In: Zbigniew Brzezinski. The Grand Chessboard: American Primacy and the Geostrategic Imperatives. NYC, New York: HarperCollins Publishers, 1997, p.53. Eric Waddell. 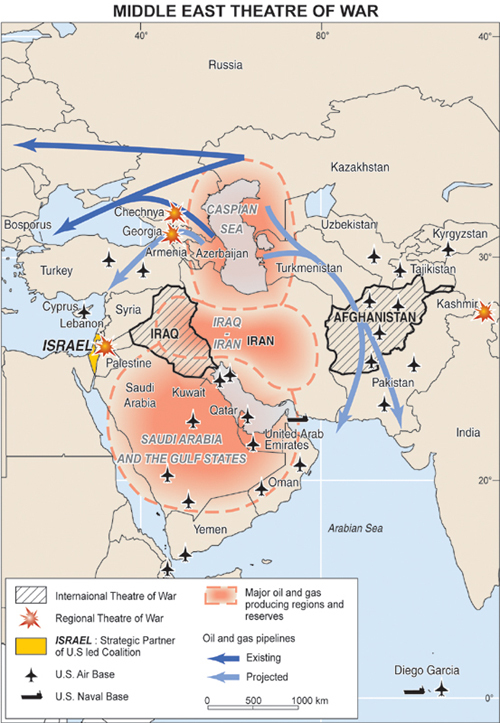 Middle East Theatre of War [map]. approx. 1:60, 000, 000. In: Michel Chossudovsky, America's "War on Terrorism." Pincourt, Qu�bec: Centre for Research on Globalization (CRG), 2003, p.2. Mahdi Darius Nazemroaya is an indepedent writer based in Ottawa specializing in Middle Eastern affairs. He is a Research Associate of the Centre for Research on Globalization (CRG).